Osama bin Laden and friends aren’t likely to participate in that debate, writes political ethicist Elshtain (Social and Political Ethics/Univ. of Chicago; Jane Addams and the Dream of American Democracy, 2002, etc. ), for they despise the very idea of freedom. “Terrorists have taken leave of politics,” she writes, in taking up arms against the innocent. As a result, she adds, no political solution to terrorism is possible: what remains is for America and its allies to determine how to arm themselves with a moral vision that distinguishes justice from vengeance—and then strike hard. Not that political work is impossible or misplaced, Elshtain hastens to add; state-building in Afghanistan may be among the best things we can be doing in that part of the world today, of greater utility than, oh, attacking Saddam Hussein. 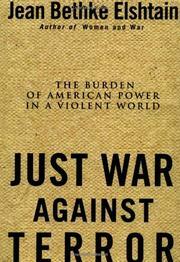 In other words, Elshtain suggests, there is such a thing as a just war, and it’s up to the US to wage it. Such a message may not be popular in the academy, though the academy is rather a more conservative place than she makes it out to be; in denouncing the wooly liberals among her colleagues, Elshtain takes particular delight in sparring with a Princeton theologian who authored the moronic observation that Jesus once attacked “ ‘the World Trade Center’ of Jerusalem” in his day, as if to excuse bin Laden of his crimes. But all sorts of people, academics and civilians, have been condemning America’s rush to war on less idiotic grounds. Elshtain seems not to distinguish sound from rhetorical arguments among the intellectual set, who are likely to be her chief readers—and many of whom are unlikely to appreciate being waved aside. All the same, a generally reasonable declaration of democratic virtues against extremism, whether found at home or in the field.